While papers start cutting back on the number of days they publish in print, they shouldn’t miss a great opportunity to make those days they do print be really special. Sunday, for instance. Remember The San Francisco Panorama? It was an issue of McSweeney’s that took the form of a fat Sunday newspaper. It cost a small fortune ($16). It had section, after section, after section. And it was unabashedly PRINT. It sold out. It sold out on the day it was first distributed in SF, then it sold out its overrun for national sales. 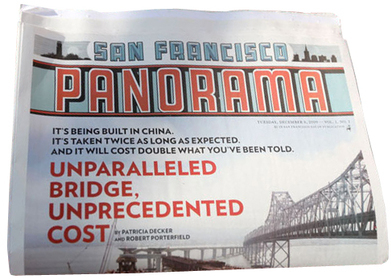 Yes, The Panorama was a one-off stunt, but Sunday papers can still be weekly events. And, if they’re full of readable, useful and fun journalism and relevant commercial content, newspaper companies can charge a lot for them.